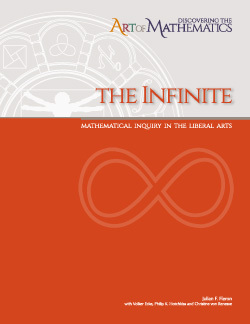 The learning guide “Discovering the Art of Mathematics: The Infinite” lets you, the explorer, investigate the great mysteries of the infinite that long captivated humankind. You explore large numbers, their meaning and emotional significance, from millions through millinillitrillions. Classical paradoxes of the infinite - Zeno’s paradoxes, the wheel of Aristotle, and convergence problems - immerse you in the infinite’s perils. You rebuild a foothold by characterizing infinitely repeated decimals and building an understanding of the convergence of geometric series. Treated with care, you find the initially paradoxical infinite objects like conditionally convergent series and Gabriel’s wedding cake to behave in more predictable ways. By simple matching you investigate cardinalities, seeing that such a simple idea leads to a concrete view of infinity. Following it systematically, you find this view generates infinitely many different sizes of infinity!